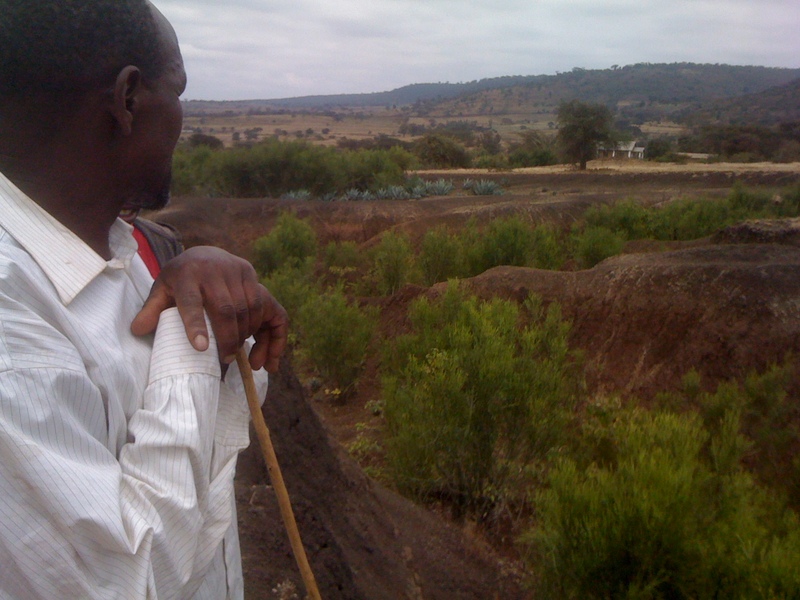 Mixed farmer, Jeremiah Chuma looking out over the korongo, or canyon, that cuts across his land like an open wound. A community reporting project with Tanzanian high school students, and aspiring journalists, Loomoni Morwo, 19, Agnes Daniel, 18, for FRW. Jeremiah Chuma stares down into a chasm. He is standing only a stone’s throw from his family home in Ngarash, a village 30 kilometres west of Arusha. The three-kilometre-long and six-metre-deep korongo, or canyon, cuts across his land like a knife wound. Mr. Chuma is a 49-year-old father of six who grows maize, beans, coffee and flowers on three and a quarter hectares of land. 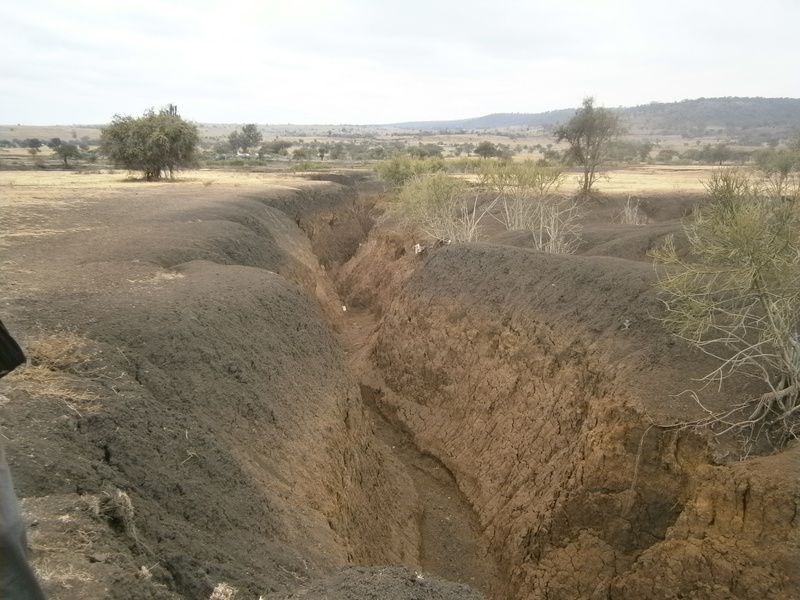 The land in front of his house used to be a passageway for livestock, but has become so eroded that it is dangerous for both people and animals. Mr. Chuma looks north across the dry, dusty plains toward the green pastures of northern Tanzania’s Monduli Mountains. Over the last 20 years, wind and water have seriously eroded the clay-rich soils. Unfortunately, the environmental devastation doesn’t stop at Mr. Chuma’s doorstep. The korongo continues south, cutting through other farming villages. Pastoralists such as the Maasai suffer financially when they lose animals; their livestock are their livelihoods. Nestled in the surrounding hills is the village of Lashaine, where Orkeeswa Secondary School students have a bird’s eye view of the environmental impact caused by the many canyons which scar the landscape. Ellie Turner is the school’s geography teacher. She is encouraging her students to take an interest in climate change. Ms. Turner says: “I’ve spoken to a lot of older people about the climate here. They say it has become much drier and the rains have been less regular … we get short, intense rainfall which [erodes] the topsoil.” The heavy rains wash away the tightly packed clay soil and vegetation, deepening the korongos. The students visited farming communities as part of their environmental studies. They were tasked with finding out how the villagers are affected by the korongos, and what they are doing to counter the threat. The students spoke with Martha Lesian in the village of Ngarash. The 42-year-old mother of nine has lost five cows, two calves and part of her farmland to an encroaching korongo. She told the students that two people have died in the korongo. A girl who attended the village primary school fell in during the rainy season and drowned, and a woman on her way to the market in Monduli took a shortcut through the steep korongo, but fell in and died. Residents in the nearby village of Lashaine have built bridges over the steepest parts of the korongo. Mr. Chuma showed students how he and other villagers have planted minyaa trees and embraced counter-erosion measures such as building soil dams inside the korongo. He says: “The [tree] roots help bind the soil, thus trapping it and decreasing the depth of [the korongo]. Also, the trees give off an unappealing scent to cattle, discouraging them from coming near.” The community hopes that these efforts will prevent the damage from getting worse. Agnes Daniel and Loomoni Morwo are students at Orkeeswa Secondary School in Monduli, Tanzania. They were assisted in researching and writing this article by Farm Radio International volunteer, Adam Bemma.